Although some people have concerns about the mercury content in salmon and other fish, the health benefits far outweigh the possible risks of exposure to contaminants, according to MayoClinic.com. Large fish, including swordfish, king mackerel and shark, have higher levels of mercury than smaller fish because they eat large amounts of smaller fish and collect higher concentrations of the contaminants. Omega-3 fatty acids, the polyunsaturated fats in salmon and other types of fish, including herring, tuna and halibut, may improve cholesterol levels and decrease the risk of heart disease. The fatty acids reduce inflammation through the body and bloodstream. Inflammation damages blood vessels to eventually cause heart disease. You may benefit your heart by including salmon in your meal two or more times a week. The American Heart Association recommends eating at least two servings of fish a week, especially fish rich in omega-3s. A serving size is about 3 oz. So getting at least 6 oz. of salmon a week provides heart-healthy benefits. People who do not eat enough fish, especially those with heart disease, should ask their doctor about taking fish oil supplements with omega-3 fatty acids. Women who are pregnant or plan on pregnancy and children under 12 have a higher susceptibility to toxins in fish. They should limit their amounts of fish to no more than 12 oz. a week and no more than 6 oz. of canned tuna a week. They should not eat swordfish, king mackerel, shark or any fish high in mercury content. 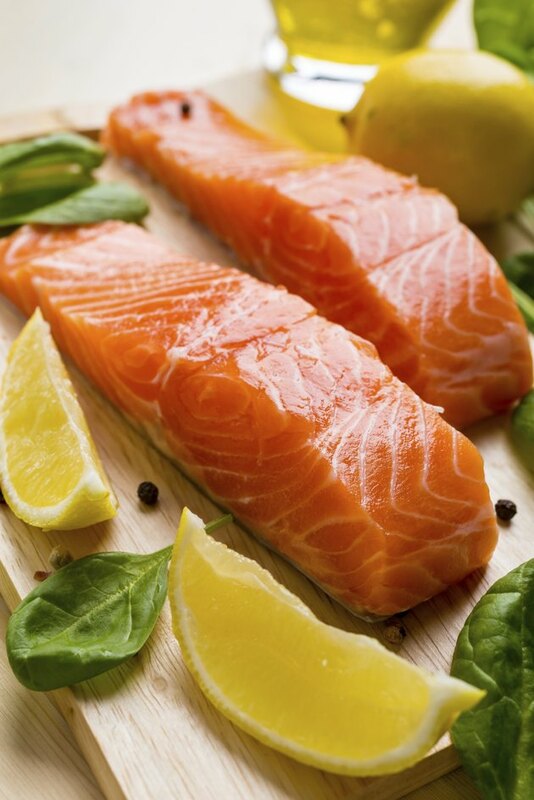 Salmon makes a healthy substitute for meat and poultry, which have high amounts of saturated fat. Saturated fat raises harmful cholesterol levels. The polyunsaturated fats in salmon and other omega-3-rich fish may lower LDL, or “bad” cholesterol, which forms plaque on the arteries that interferes with blood flow to the heart and results in heart disease. Salmon and herring are among the fish containing the most omega-3 fatty acids. Inuit Eskimos in the Canadian Arctic have a diet that includes high amounts of omega-3-rich fish. They tend to have decreased triglycerides, or fats in the blood, according to the University of Maryland Medical Center. Excess triglycerides contribute to heart disease. The Inuit Eskimos also have high HDL cholesterol levels. HDL, known as the “good” cholesterol, clears the bloodstream of excess cholesterol and delivers it to the liver. Omega-3 fatty acids may play a role in improving moods to help conditions such as depression and attention deficit hyperactivity disorder, or ADHD, but studies continue on the effectiveness of fish oil in these areas.